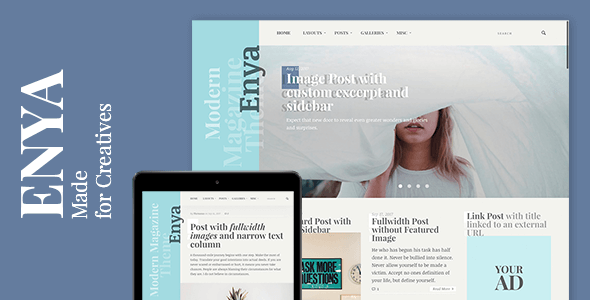 Enya is a flexible WordPress theme, perfect for any blog or online magazine website. Enya is simple, lightweight and easy to use. Enya theme is unique, modern, fabulous. Itâ€™s a great tool to express your personality. You can select between 5 different layouts for your home page, archive pages, author pages, search results pages, tags and categories and use various options to style your blog. Optional Sticky Primary Menu and Sticky Sidebars. Widget areas before and after post content. Widget areas before and after header. Custom layouts for Flexible Posts Widget plugin.